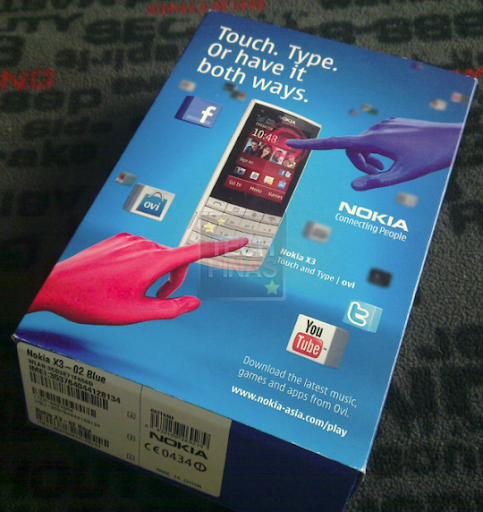 One of the more popular new generation Nokia handsets, Nokia X3-02 Touch and Type. Nokia X3-02 Touch and Type is the first Nokia phone to don both a touchscreen and an alphanumeric keypad. The keypad is ideal for messaging and calls and is optimized for one hand use. The touch screen, on the other hand, allows easy access to social networking accounts and smooth online surfing. So you have the phone itself, the charger, the battery, the USB connector, the earphones, manuals, and the warranty card. I have to tell you, Nokia X3-02 is one of the cutest phones I've ever seen. And it's very thin too! I'll just play with the phone for a few days and let you know what I think about it. *Music-centric and wifi-capable Nokia X3-02 Touch and Type is now out in the Philippines. The suggested retail price is only Php 8,560.